Theatrical impresario Jack Hylton brought the Crazy Gang to ITV under his production arrangement with Associated-Rediffusion, presenting them in a number of programmes including selections from their stage productions and also quizzes and variety shows. 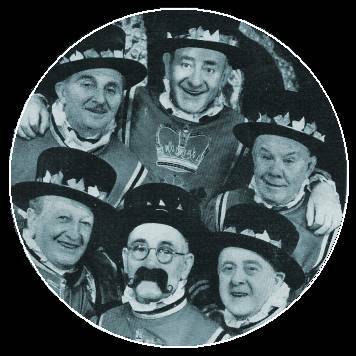 It was an obvious idea to bring them to TV, and at least two of their first six TV shows, called "Friday Night with The Crazy Gang" in 1956, featured extracts from a Crazy Gang theatre production, Jokers Wild, which Jack Hylton had mounted at the Victoria Palace in London since the end of 1954. In 1957 Hylton produced another series of six shows for television based on the 'Together Again' stage show of 1947. Bud and Chesney reworked vintage sketch material and sang old favourites such as 'Underneath The Arches' and 'Run Rabbit Run'. A feast of nostalgia was guaranteed, and the shows - thankfully preserved on film - are a valuable record of the beloved double-act. 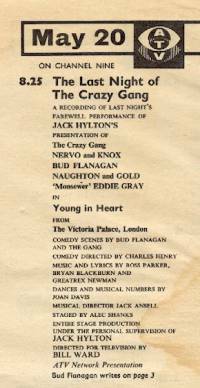 Hylton screened one further Crazy Gang programme in 1957: a 45-minute excerpt from their latest Victoria Palace manoeuvre, These Foolish Kings, on 1 August. 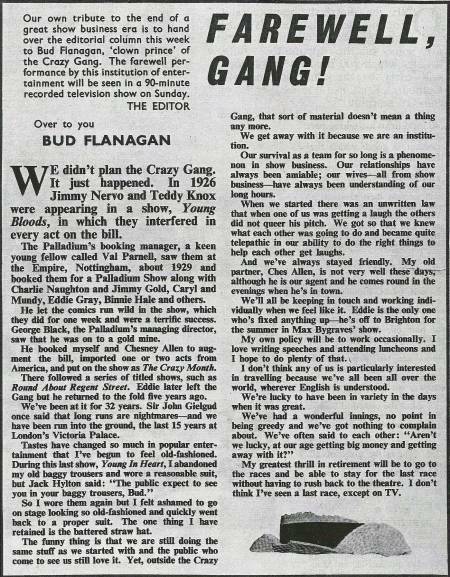 The following year the gang members were resident comics on the Hylton-produced Make Me Laugh (six editions, 15 September-20 October 1958), a game-show based on an American format in which comedians attempted to make contestants laugh. Because the contestants' winnings mounted up for every second that they remained straight-faced, this was a difficult task. This show was an abject failure - horrendously misconceived, it is a legendary turkey in the annals of British television history and a black spot on the otherwise impeccable record of the irrepressible Crazy Gang. The Gang's last British TV appearance together was a tele-recording of the final night of their Hylton-produced stage show Young In Heart, again presented at the Victoria Palace. 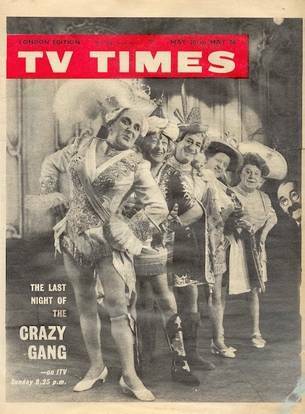 This 90 minute presentation was networked on ITV on 20 May 1962 as The Last Night Of The Crazy Gang, directed by Bill Ward for ATV. Bud Flanagan also made his first ever TV series - claiming to be playing his first acting role of any kind - in a fascinating ATV sitcom called 'Bud'. The theme was simple: the Crazy Gang had disbanded and Bud needed a new job, so each week would find him scouting around in new directions: as a bookmaker (appropriately, for in real life Flanagan co-owned three turf accountant shops in the East End of London), night security guard, male nurse and so on. Fellow Gang members Chesney Allen, Charlie Naughton and 'Monsewer' Eddie Gray appeared here and there, as did perennial straightman Jerry Desmonde and showman/band leader Jack Hylton. Down among the small print, Nigel Hawthorne had a minor role in the final episode.